This free webinar, presented by Office of National Drug Control Policy (ONDCP) Acting Director Michael Botticelli and SAMHSA Chief Medical Officer Elinore McCance-Katz, M.D., Ph.D., will review Federal policy related to opioid misuse, abuse, and overdose and will provide an overview of the SAMHSA Opioid Overdose Prevention Toolkit. The etiology of opioid abuse and clinician interventions that can reduce the risk of misuse will be addressed. The SAMHSA Opioid Overdose Prevention Toolkit provides information on clinical approaches to safe opioid prescribing, risk assessment for overdose, symptoms of overdose, and emergent care in the clinical situation of opioid overdose, including the use of the naloxone antidote. Continuing medical education is available. Opioid Overdose Prevention Toolkit (2014): Are you up to date? SAMHSA is! Opioids are valuable tools for addressing pain; however, overdose is always a concern. The Opioid Overdose Prevention Toolkit equips communities and local governments with material to develop policies and practices to help prevent opioid-related overdoses and deaths. The Opioid Overdose Prevention Toolkit Addresses issues for first responders, treatment providers, and those recovering from opioid overdose. Opioid overdose continues to be a major public health probem in the United States. It has contributed significantly to accidental deaths among those who use, misuse or abuse illicit and prescription opioids. In fact, U.S. overdose deaths involving prescription opioid analgesics increased to about 17,000 deaths a year in 2010 [1, 2], almost double the number in 2001 . This increase coincided with a nearly fourfold increase in the use of prescribed opioids for the treatment of pain . Opioids include illegal drugs such as heroin, as well as prescription medications used to treat pain such as morphine, codeine, methadone, oxycodone (OxyContin®, Percodan®, Percocet®), hydrocodone (Vicodin®, Lortab®, Norco®), fentanyl (Duragesic®, Fentora®), hydromorphone (Dilaudid®, Exalgo®), and buprenorphine (Subutex®, Suboxone®). Opioids work by binding to specific receptors in the brain, spinal cord and gastrointestinal tract. In doing so, they minimize the body’s perception of pain. However, stimulating the opioid receptors or “reward centers” in the brain also can trigger other systems of the body, such as those responsible for regulating mood, breathing and blood pressure. A variety of effects can occur after a person takes opioids, ranging from pleasure to nausea, vomiting, severe allergic reactions (anaphylaxis) and overdose, in which breathing and heartbeat slow or even stop. Opioid overdose can occur when a patient deliberately misuses a prescription opioid or an illicit drug such as heroin. It also can occur when a patient takes an opioid as directed, but the prescriber miscalculated the opioid dose or an error was made by the dispensing pharmacist or the patient misunderstood the directions for use. Also at risk is the person who takes opioid medications prescribed for someone else, as is the individual who combines opioids — prescribed or illicit — with alcohol, certain other medications, and even some over-the-counter products that depress breathing, heart rate, and other functions of the central nervous system . Discharged from emergency medicalcare following opioid intoxication orpoisoning. At high risk for overdose because of alegitimate medical need for analgesia,coupled with a suspected or confirmedhistory of substance abuse, dependence, or non-medical use of prescription orillicit opioids. Completing mandatory opioid detoxifi- cation or abstinent for a period of time(and presumably with reduced opioidtolerance and high risk of relapse toopioid use). Recently released from incarcerationand a past user or abuser of opioids(and presumably with reduced opioidtolerance and high risk of relapse toopioid use). Tolerance develops when someone uses an opioid drug regularly, so that their body becomes accustomed to the drug and needs a larger or more frequent dose to continue to experience the same effect. Loss of tolerance occurs when someone stops taking an opioid after long-term use. When someone loses tolerance and then takes the opioid drug again, they can experience serious adverse effects, including overdose, even if they take an amount that caused them no problem in the past. For much more information about these and other issues, including key strategies to prevent opioid overdose, check out the full SAMHSA Opioid Overdose Prevention Toolkit Updated, released in August of 2014. The toolkit includes a full digital version, Facts for Community Members, Essentials for First Responders, Safety Advice for Patients, and Information for Prescribers. The toolkit also includes resources for Overdose Survivors and Family Members. The toolkit was prepared for the Substance Abuse and Mental Health Services Administration (SAMHSA) by the Association of State and Territorial Health Officials, in cooperation with Public Health Research Solutions, under contract number 10-233-00100 with SAMHSA, U.S. Department of Health and Human Services (HHS). LCDR Brandon Johnson, M.B.A., served as the Government Project Officer. 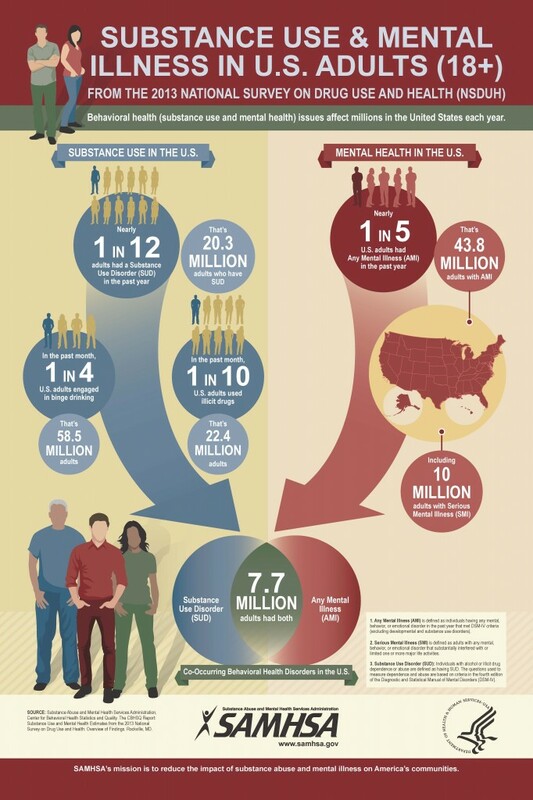 The NSDUH Report provides 2013 estimates on the prevalence of substance abuse and mental illness in the U.S. Also reports on the need for and barriers to substance use treatment, mental health care, and co-occurring substance use disorders and mental illness. Most likely many of you are familiar with the recently published studies on SBIRTpublished in the Journal of the American Medical Association (JAMA). Although these studies contain some very solid research data, their focus does not do justice to the benefits SBIRT brings to behavioral health. In case you have not seen the articles, the two studies (and the related editorial) are attached. SAMHSA believes these two papers are of substantial interest. However, it is important to look at the papers from the proper perspective. Both papers focused on the Brief Intervention (BI) part of SBIRT, not the Screening part and not the referral to treatment (RT) part. These two studies were well done and elaborate. However, the value of SBIRT could not be challenged by either study. Furthermore, the value of SBIRT to behavioral health and primary care providers is the ability of SBIRT to identify when a patient is in need. When patients have chronic medical problems, there are multiple opportunities to address the issue of substance use. Roy-Byrne noted the majority of his participants had a single brief intervention contact, with only 47% receiving a follow-up booster call. Saitz reported a single session approach for his two test conditions. During the 11 years since SAMHSA’s SBIRT program has been in existence, over 2 million people have been screened. Of those, only a small percentage screened positive for any “at risk” behaviors, with about 11 percent of those screened receiving a brief intervention. Without screening many of these people might have remained invisible. SBIRT gives providers and primary care physicians an opportunity to identify potential alcohol and substance misuse or abuse and, through brief intervention, an opportunity to use that “teachable moment” to educate patients and, potentially, change the behavior of “at risk” individuals for the better. Roy-Byrne’s title “Brief Intervention for Problem Drug Use in Safety-Net Primary Care Settings” really is applicable to both papers. Ninety-one percent of Roy-Byrne’s participants were unemployed, while 81% of Saitz participants were on Medicaid or Medicare. Fifty-six percent of Roy-Byrne’s participants had greater than one ICD-9 Mental Illness code, while 46% of Saitz’s participants had a co-morbid mood disorder. Saitz required his participants to have an ASSIST score of greater than 4 in order to participate. That is understandable, since the World Health Organization (WHO) recommends that an ASSIST score of 4 to 26 should result in brief intervention and a score of 27+ should result in more intensive treatment. It is important to remember brief intervention does not work for everyone. For many, learning the consequences of their “at risk” behavior or abuse can provide the wake-up call they need to either stop using or seek appropriate treatment. For individuals with more severe and complex substance use disorders, brief intervention will most likely not be sufficient to change their behaviors. For this group it is important that a treatment referral be made. When dealing with complex patients with complex problems, is it reasonable to expect BI to “cure” the substance use disorder? No. The question for SBIRT is whether it is feasible to screen for drug use disorders in primary care, just as it is feasible to screen for alcohol use disorders. Both papers implicitly say “Yes.” Thus, if it is feasible, the next question is whether it should be done. We believe that if we are to promote integrated treatment, primary care providers (PCPs) must have the basic skills necessary to identify SUDs in primary care settings. SAMHSA’s SBIRT program accomplishes this. SBIRT is not a panacea, it is an important process that can help primary care providers identify alcohol and drug use problems. We have to wait for research on more representative populations to determine whether BI works. We invite any thoughts you have on this issue. Also, if you have seen any feedback/reactions in your setting, please share that information. The “Screening and Behavioral Counseling Interventions in Primary Care to Reduce Alcohol Misuse” Booklet (ICN 907798) was revised and is now available in a downloadable format. This booklet is designed to provide education on screening and behavioral counseling interventions in primary care to reduce alcohol abuse. It includes information about risky/hazardous and harmful drinking. The Legal Action Center is the only nonprofit law and policy organization in the United States addressing the needs of persons with substance use disorders. The organization has national subject matter experts on Federal regulations governing confidentiality of alcohol and drug abuse patient records (42 CFR Part 2) and the Health Insurance Portability and Accountability Act (HIPAA) privacy regulations. The Webinar will be followed by a question-and-answer period. You are encouraged to view the first webinar for important information on the a) essentials of Federal Regulation 42 CFR Part 2; b) interplay between 42 CFR Part 2 and HIPAA regulation in settings where primary care and substance abuse/mental health services are co-located or integrated; and c) substance abuse documentation and information sharing using electronic health records. New videos, courses, and support resources are available for adoption and adaptation. If you are implementing SBIRT, you need tools to help. We’ve been involved in an array of large scale design, development, and implementation efforts. We’ve gathered some of our efforts and placed them on sbirtinaction.org to make them easy to find. Need an SBIRT course? SBIRT videos? Help designing or implementing SBIRT? Academic Edge, Inc. is a small business specializing in education and health behavior change tools and resources. Paper, web, even virtual reality, we’ve done it all. How can we help you do effective, engaging, and fun things with your target audience?